The acronym MEETS describes the local and state decision-making value of a new labor market information series�information that meets needs voiced by business executives, workers and educators who make investment, career path and curriculum mix decisions based on limited understanding of local business and employment dynamics, including profiles of job creation, growth and decline; and related hiring trends. MEETS draws upon local, state and national resources to design and deliver MEETS Briefs and other new ways of packaging information that responds to business, worker and educator priorities. The individual sources of information pulled together by MEETS are not new, but until now the sources were maintained by different organizations for unrelated administrative uses. MEETS, then, is a value-added brokering activity that transforms isolated components into valuable new information products. The Jacob France Institute at the University of Baltimore (http://www.ubalt.edu/jfi) began the pilot phase of MEETS building on a foundation of ADARE network management experience (http://www.ubalt.edu/jfi/adare). Since 1998, teams of researchers and state agency staffs in the ADARE states have cooperated in the development of secure repositories of linked confidential administrative records that have then been used for mutually agreed upon research and evaluation purposes. 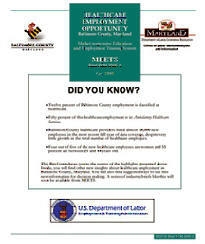 The existing ADARE partnerships contributed to successful recruitment of charter states in the Census Bureau Local Employment Dynamics (LED) program (http://lehd.dsd.census.gov). Each state that participates in the Census Bureau LED program has negotiated a Memorandum of Understanding that authorizes quarterly state deliveries of UI wage records and industry affiliation information to the Bureau. These confidential administrative records are linked behind a secure firewall with other data sources maintained by the Bureau. The combined extracts are then transformed into a series of Quarterly Workforce Indicator (QWI) releases that have been defined by state and Bureau partners. The Census Bureau LED program QWI series satisfies all state and Federal standards for public release without disclosure of any person or business identity. The LED program web site continues to reflect ongoing enhancements that respond to customer needs and suggestions. This enables local and state users to download a variety of tabulations and graphics based on their own specifications of interest. The MEETS role begins where the current Census Bureau LED program capacity ends. The MEETS team at The Jacob France Institute is in frequent contact with the Census Bureau LED program management team, and with some of the program�s state partners. The Jacob France Institute MEETS team has been authorized to receive Census Bureau LED program updates of the QWI series at the same time cooperating states receive this new information. Prior to each quarterly update, the MEETS team communicates with local and state partners to define each area�s highest priority for rapid turnaround customized attention. The portfolio of MEETS Brief samples that appears here is one of several product lines developed to date. Others are available upon request from MEETS manager Jeff Gabriel (jgabriel@ubalt.edu). A recent profile of employment level and job creation or loss by locally defined drill-downs within larger industry clusters (using official NAICS codes), with a count of new hires in this cluster by age groups and gender. URL�s for easy access to more detail about the Census Bureau LED program, BLS technical documents and related data sources, and state LMI contact information to get expert advice about occupational staffing and wages within the industry covered. Suggested next steps for local workforce development system partners to take themselves so maximum value is gained from each MEETS Brief.